Hi there everyone, Jennifer here again. The days have been so dreary of late so I thought I would try and bring a smile to your faces lols. As we are getting nearer to Halloween, I decided to leave Christmas cards aside for the moment and show you a card I made recently for Sue and Harvey of Imagination Crafts. 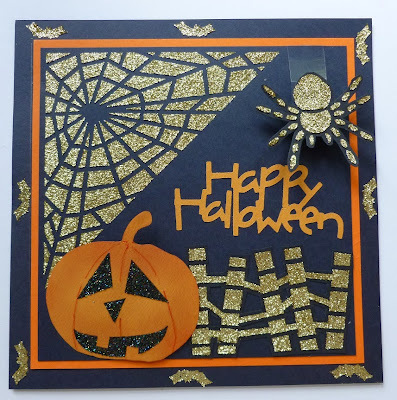 This is made using one of their fun Halloween stencils. 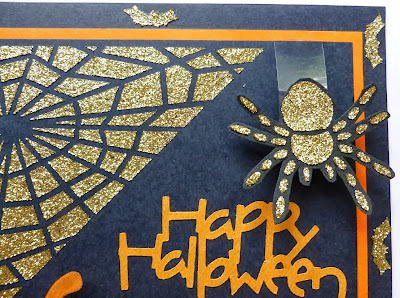 Make a black base card and spread gold sparkle medium over the stencil making small bats around the edges of the black card. Matt a smaller piece of orange card onto the base card. Using the spider's web corner stencil, lay it on another piece of black card and spread the gold shine over the web on the top left-hand corner of the black card. When dry, do the same with the crooked fence in the bottom right corner. 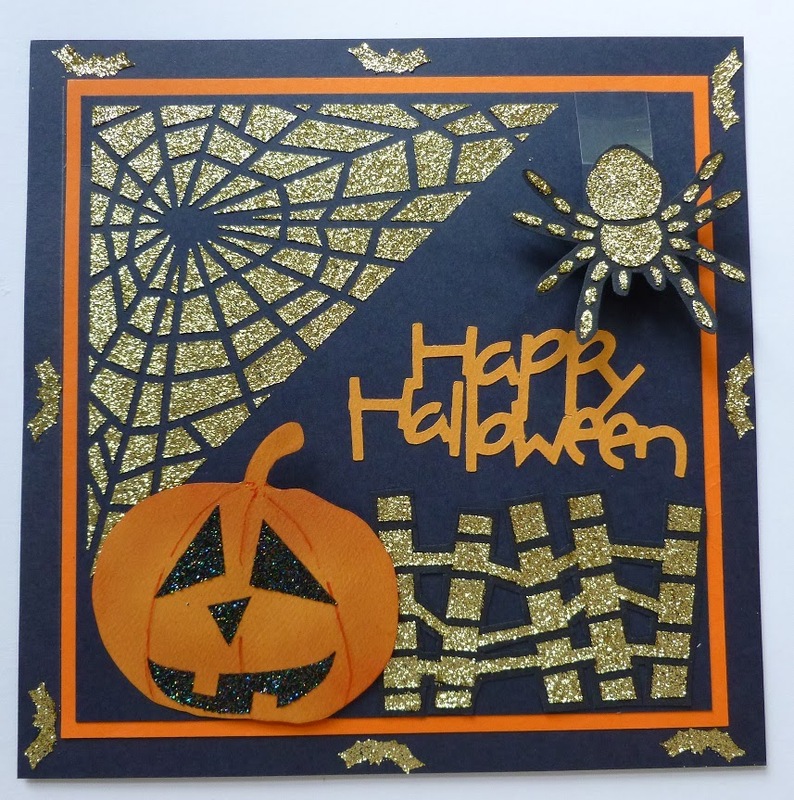 Spread the gold sparkle medium over the spider onto some black card. When dry, cut out the spider and glue onto a strip of acetate. Glue the acetate to the back of the black card at the top right, so the spider moves. Matt this onto the orange card. 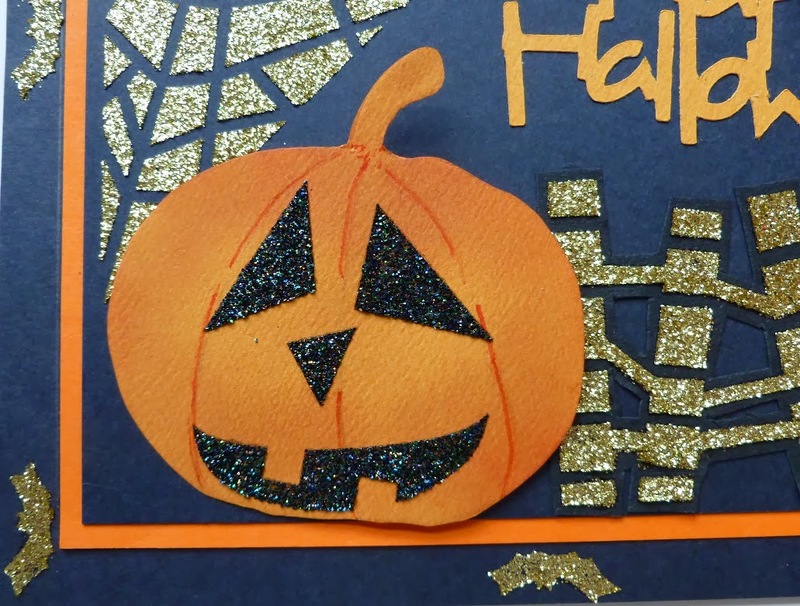 Using a Cricut machine or similar, cut out 'Happy Halloween' from orange card and glue to the base card. Using the stencil and orange card, trace around the pumpkin and cut out. Spread the black Stars Sparkle Medium over the eyes, nose and mouth of the stencil, onto white card. When it is dry, cut them out and glue to the pumpkin. Glue the pumpkin to the left of the base card, using silicone glue. Well the weather sure has changed over the past week, it might be mild but very wet. We hope that you have managed to stay dry when venturing out. Tonight I am sharing one of my cards I made using one of the new Christmas Decoupage stamp sets called Snowman which you can purchase it here. 1. A5 scalloped white card which I have matted and layered paper from LOTV Frosty Christmas I have wrapped white and silver ribbon around before adhering to the card. 2. 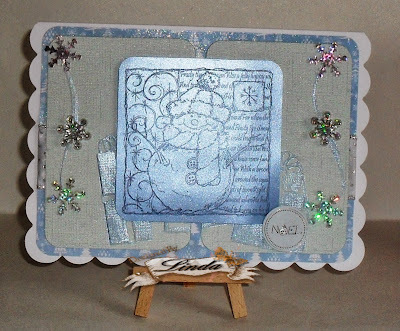 My next layer is Core'dinations Traditional Christmas card I have cut into 2 rectangles and painted the embossed presents with Mica Powder (Imagination Crafts). 3. The topper I have covered with Versamark and dusted Mica Powder over then stamped the Snowman (Imagination Crafts) with Distress Ink Chipped Sapphire. To seal I have sprayed cheap hairspray over the image. 4. Down both sides I have used 2 snowflake buttons and 4 snowflake embellishments. 5. To finish off I have added the sentiment. Well they call them decoupage stamps, so I thought that I would do just that with one of them. 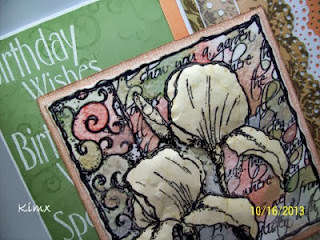 I stamped and embossed the Iris onto watercolour card and then painted it with an Imagination Pearly Palette by making the card very wet and the 'dropping' colour randomly over the image. This creates a lovely blended effect which I heat set because like all crafters I'm impatient and want to see the effect NOW!! I stamped and embossed the image again onto a piece of cream background paper and then fussy cut the Iris before adding them to the watercolour panel using silicon. I shaped each of the pieces first on a pergamano mat with a very large embossing tool. The other thing that I really like about these stamps, as well as the designs of course, is that each set is accompanied by a greeting and a couple of background stamps so they really are such good value for money. 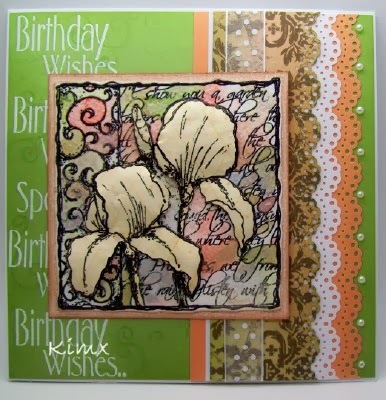 I have stamped and embossed the greeting in white onto the green background paper and then added some swirls using a Versamark pad. 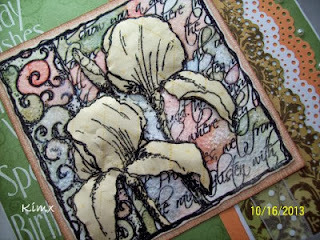 The punched and layered border has been created using papers from my stash and a Martha Stewart punch.